FREE Ground Shipping within USA on all online orders of $75 or more. Free Pack of Ratlami Sev on order of $45 or more. Bulk / Party orders or Corporate Gifts are welcome. Call us if you have any questions. Content: 1 Pound (8-9 Pcs/lb). Sweet soft balls are dipped in light sugar syrup to give these kala jamun a distinctive texture and taste. Major Ingredients: Whole Milk, Flour, Sugar, Ghee (Clarified Butter), Corn Oil, Cardamom, & Pistachio. *Our sweets are made fresh using traditional recipe by real chef. Refrigerate upon receiving, serve chilled for best taste. The difference between Gulab Jamun and Kala Jamun: Gulab Jamun is soft and Juicy, where Kala Jamun is less juicy and Firmer, yet delicious. Shipping Cost $9.99 Buy multiple items online from Bengali Sweet House to SAVE on shipping. We ship most orders within 2 business days of receipt of payment. Shipments may be delayed due to inventory, shipping and weather issues. If you wish to have any special shipping instruction please say so at the bottom of the page when you pay for the order online. All merchandise is shipped from our facility in New Jersey, USA. We use USPS or UPS for all your shipping needs. You can choose between Express (1 to 2 day delivery - starting @ $19.00) or Ground (3 to 5 days delivery - starting @ $9.99) at the time of check-out. FREE Shipping if available is only applicable to contiguous USA. There may be additional charge for shipping to Alaska, Hawaai or Puerto Rico. We will let me know of any additional shipping charge once your order is placed. We DO NOT ship to PO Box. We cannot take any responsibility of the shipment in transit(theft or damage) after it has left our facilities. If there is any issue with any order, we will attempt to contact through your phone and email contact info provided by you. If none is provided your order may not be shipped if there is a problem. We only accept orders to be shipped in the contiguous USA. Refunds: Due to the perishable nature of the order we will no longer be accepting returns. Once you have ordered, you will be billed and sent the product. If there is a mistake in the order from our side, we will compensate for that. All items that have been noted as needing to be shipped via UPS Next Day Air, MUST be shipped via UPS Next Day Air. Avoid Sweet Orders on Thursday or Friday, we don't want UPS to keep sweets over the weekend in their storage or on the truck. Fresh Bengali Sweet and Motichoor Laddoo are very soft and may break during shipping. It is customers responsibility to provide proper shipping address, phone and email address, improper information my delay the shipment or may not be delivered by UPS. This item in Indian Sweets Online category was first added to our catalog on 05-01-2013. 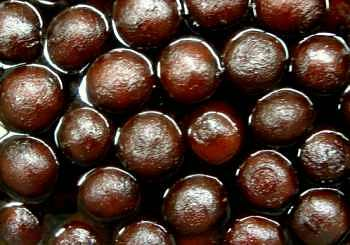 Buy Kala Jamun, 1 Pound, sold & shipped by Bengali Sweet House where you can shop online for Quality Indian Sweets, Snacks & Gift Baskets Shop - Bengali Sweet House. This Indian Sweets collection has been tagged as Jamun, Indian Sweets Gift Basket, Indian Mithai.